Consignments are due May 1 for the 2019 TQHA Yearling Sale with a new session for Horses of Racing Age. 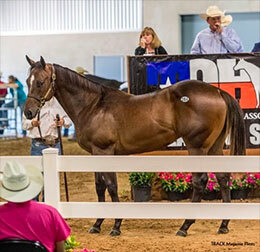 ELGIN, TX—MARCH 21, 2019—Consignments for the 2019 TQHA Yearling Sale with a new special session for "Horses of Racing Age" are due May 1. The annual sale will be held again in The Exposition Hall at the Freeman in San Antonio, Texas on July 26 and 27. All yearlings selling in the sale (must pass through sale ring) must be accredited Texas-Bred and are eligible for the 2020 $500,000-est. TQHA Sale Futurity(RG2). Horses of racing age are not required to be Texas-bred. CLICK HERE to download a 2019 consignment form. Horsemen and women are asked to include entry's original registration certificate, a signed AQHA transfer form and the $600 consignment fee when they submit their consignment form(s). For additional information visit the association's website at tqha.com or call 512-458-5202.